In an increasingly globalized world it is becoming progressively important to localize, as mentioned in a previous article. This means that it is not sufficient enough to just ‘be there:’ products, services and even mobile phone apps cannot simply be translated, but need to be culturally adapted. Smartphones enjoy a greater popularity than ever before. As claimed by Unified Communications Strategies, 717 million smartphone shipments to retailers were made in 2012, which was a 45% increase to the previous year. Android smartphones had the biggest market share with 56%, followed by Apple with 22.9%. Microsoft only came 6th with a market share of 1.9% (source: Gartner). 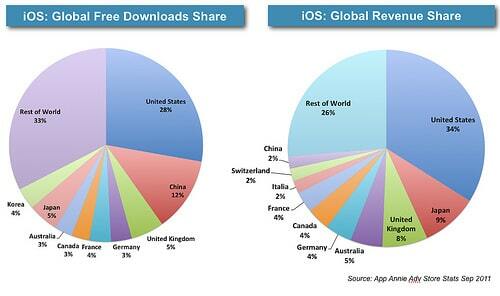 According to App Annie, English-speaking countries, such as the UK, USA, Canada, Australia, only accounted to 39% of the global free download shares for Apple’s iPhone and just 51% of the global revenue from iPhone apps. The second biggest share had East Asian countries China and Japan. Although this data is from September 2011 and might not do justice to recent developments, it proves how important it is to localize apps, because most of the app users are not native speakers of the English language. On top of this, keyword searches for ‘best iPhone app’ and ‘best Android app’ (Google Global Market Finder) revealed that for instance in Germany, internet users search for these terms in their mother-tongue language with yearly 720,000 local searches in comparison to 264,000 searches in English. In Italy, the difference is even greater: yearly 324,000 local searches are made in Italian and only 96,000 in English. Generally speaking, not only apps translated from English into the local language have a much higher possibility for success. If a product or service is localized, it will feel and look of having been created for the target audience. If a business takes the extra step to accommodate the needs of the local customers, it shows that their clients are important to them. And in addition, the majority of people are most likely to buy products with information written in their native language. If you’d like to find out more on the importance of localization or to find out more about our localization services, please contact us.